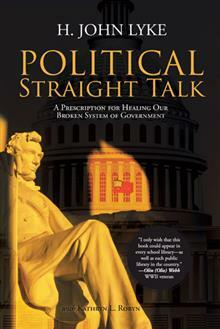 Kathryn: Political Straight Talk, like its subtitle states, is a prescription for healing our broken system of government. The book starts as a continuation of the discussion of John’s previous books, The Impotent Giant: How to Reclaim the Moral High Ground of America’s Politics and What Would Our Founding Fathers Say?—How Today’s Leaders Have Lost Their Way. First we lay out the vision the Founders of the United States of America had for a democratic republic with liberty and justice for all, the interpersonal processes of integrity they called upon to come to agreement in creating the documents upon which our overall mission of freedom (The Declaration of Independence) and the structure that would maintain that (The Constitution) were based, and the many ways we have struggled to live up to that vision throughout our history, by turns failing and progressing. Our view is that at our current crossroads, we are failing. The rest of the book talks about ways to fix that, including a discussion of psychological processes needed to restore the leadership and citizenry to sanity, four amendments to the Constitution to address persistent systemic issues with power and alienation in politics, and a call for love, for without empathy, compassion, and love for all the people, not only our democracy, but the planet itself will likely be lost in our grandchildren’s lifetime. John: I became interested in history only as an older man, never having really had the opportunity to study it at school. I read everything I could get my hands on about our Founding Fathers and was particularly inspired by George Washington, Benjamin Franklin, and though he was not an original Founder, one might say he was the first founder of the country as a free state, Abraham Lincoln. Though very different men, they shared an implicit and passionate sense of what our second president, John Adams, referred to as “public and private virtue,” the twin qualities of integrity they each believed no democracy could survive without. I looked around for that quality in our leadership today, and found it wanting. I decided to explore why. Kathryn: We are both passionate about the importance of love in all decision-making by government and business, in addition to our personal lives. When money or profit is the valued goal or motive, oppression and alienation will result, because the profit mentality is built around the idea of scarcity. The idea that we are all in competition for resources and successful outcomes has grown beyond the small business model into the realm of government, as if there is not enough liberty and justice and well-being itself to go around. Love has the opposite view: that with all of us pulling for everybody, there is plenty to go around, not just for liberty and justice, which should be free to all, but resources as well. In a healthy family, you don’t just feed some of your children and one parent; you make sure everyone is equally cared for to reach their potential. The same must be true in a democratic republic. Kathryn: I’d like to say I dance a jig, but the knees aren’t what they once were. [Laughs.] But we did talk on the phone and share a nice grin. John: Since I’m 84, dancing a jig is out of the question. That’s because if I ever knew the steps involved, because of my age, I wouldn’t remember them today. Besides, my arthritic leg would prevent me from dancing even if I knew the steps! John: Kathryn! I’ve said this many times, and though Kathryn gets embarrassed by it, I can’t say it enough that when I found her as an editor, my writing life changed to something I could respect and feel respected for. That was a great gift to me in my life, not just as a writer, but as a human being. Plus, over the years, she has unselfishly served as a marvelous catalyst for me to strive for excellence; it indeed has been an honor and a privilege to have received her generous tutelage over the years. Kathryn: Thank you, John! I have been an avid reader since I was a child; consequently, my influences are abounding. But I’d have to say that it was songwriters from Joni Mitchell to Paul Simon and Johnny Mercer to Beyoncé that have given me the sense of story, rhythm, and imagery with which I try to keep the reader engaged and turning pages. John: To heal our beloved country! To get a national discussion going that brings back integrity as the number one quality we look for in politicians and infuses love into the electorate as well as the leadership when making laws that affect We the People. Kathryn: It’s a gargantuan task admittedly, but I think my efforts also lean in that direction.